Killer Characters: Now What Did We Do With That Body? Now What Did We Do With That Body? 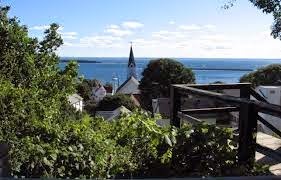 Evie Bloomfield here and it’s been a great summer on Mackinac Island...if you don’t mind a dead body or two. The first thing about our body is that no one’s passing the crying towel that’s for sure, but that’s not the problem. The problem is that a dead body scares off the tourists! If there’s one thing all of us here on the island do not want to happen is that! Our little island that’s a time-warp back to the 1800s rely on the tourists who we call fudges. So the thing is where can we get rid of that pesky old body? I have a few suggestions and you can tell me which one appeals to you. Keep in mind all of these suggestions require strapping the body to a bike or renting a horse and buggy. First we can hide the body in Arch Rock. There’re enough bushes there to hide the corpse and it’ll be like they just fell off the rocks. Splat! Or we shove the body back in Skull Cave. That place sounds a lot scarier then it is and the cave is too small. Then again maybe the fudgies will think it’s part of the attraction. There’s Fort Mackinac. I saw a pit where they put the bad guys. Maybe we can dump the body in there...till it started to stink. Saint Ann’s Cemetery is a good choice, a body just fits right in. What’s one more dead guy more or less. the body up in one of those rocking chairs on that really looooong front porch they have. Be part of the Halloween décor. 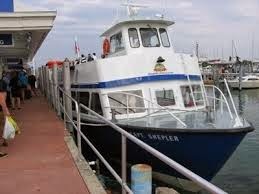 Or just push the body off Shepler’s dock or off the ferry on the ride back to the mainland. Where would you get rid of the body? 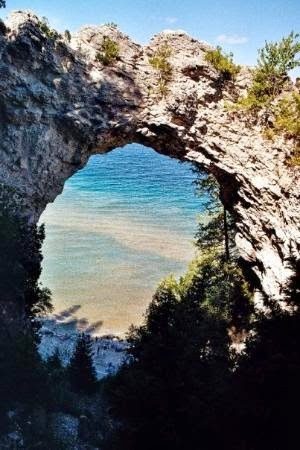 Mackinac Island is a great place for more than eating fudge. Some people have a drop-dead good time. 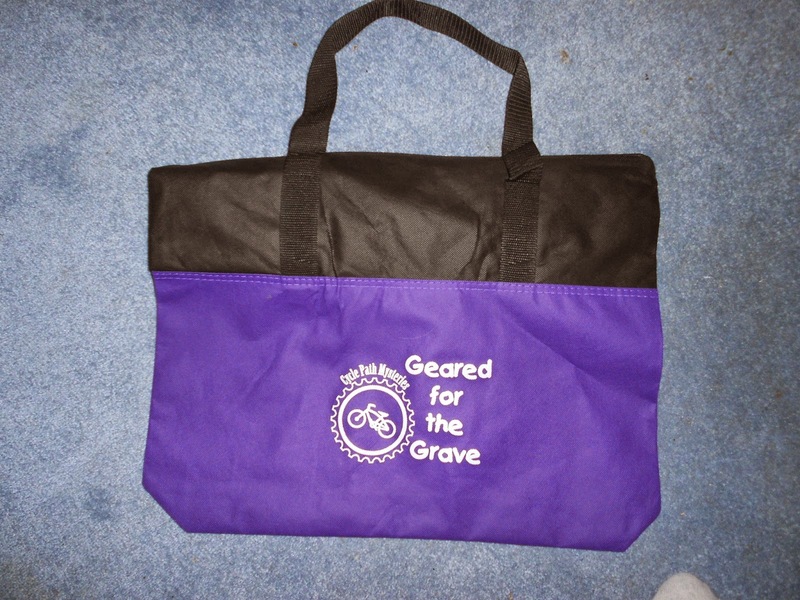 I’ll give away 2 Geared for the Grave totes from your suggestions…we really need to get rid of this body! Saint Ann’s Cemetery is a good choice, provided that there has been a recent burial—it should be relatively simple to dig up that gravesite and plant a new body on top of the buried casket or even inside the casket, and no one would look askance at the site knowing that someone was recently buried there. I also would try to make sure that there are plenty of aromatic flowers at the gravesite to help cover up the smell of a decaying body. After all, the original intent of bringing flowers to a burial to place on the body was to help cover up the odor. I can’d do Dexter…scares the bajeebers out of me but the pushing off the boat idea is good. Fact is, someone threatened to do that to me. Guess I was getting too close to finding the killer! Yikes! Oh Kiki! I do that too! You are too funny. What till you see where we ended up stashing the body. Holy cow! Hi, Traveler. Yeah, the cave is probably the least best place. Wait till you see where we parked the body…least for little while till after peak tourist season. Hi, Petite! Yep that is one deeeeep lake and so remote. Now to get that body on the boat! Really tough with no cars to haul. I think you dress it up as art and prop it up at Richard and Jane Manoogian Mackinac Island Art Museum. You can be long gone before anyone notices the smell. well you could cut the body up and put a part in all the places mentioned. Hi, Marcy. Yikes! Don’t think I got the stomach for that one!!! Definitely the cemetery. It would be very easy to just place it in with another body...hide it in a mausoleum...or maybe even hide it in an overgrown area of the cemetery. I have an old, 1800s era cemetery on the hill behind my house...it is slowly creeping closer each year, and no one goes up there anymore, so it would be an ideal place. 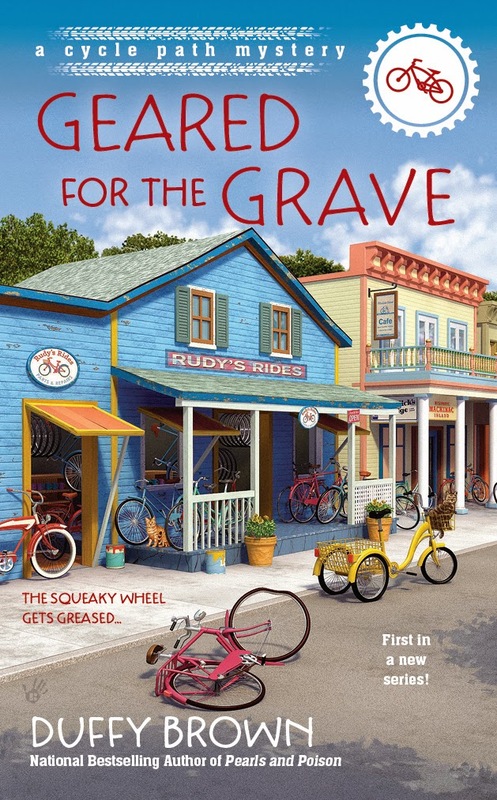 Oh, Brooke, a cemetery for a neighbor…I lvoe it. A great place to hide a body for sure. Thanks! Hi, Debby. Arch Rock is a terrific place. Just toss that body into the bushes but soooo hard to get that body up there. I, too, like the idea of hiding the body in Arch Rock. Hi, Malka, Yes, I could haul that body on like it was a drunk person then leave it! This may be a duplicate. I tried once before. Leave the body on the beach covered with a towel and put a beer in his hand. Thanks for all the great ideas on where to hide the body!! The winners of the totes are: Kaye Killgore. Traveller, Kiki. I guess I am too late, but I will post my suggestion anyway. Dress up the body like a scarecrow and put it in a sitting position in front of one of the many fudge shops. If the book is during another time of the year, use the closest appropriate holiday, a bunny for Easter, Uncle Sam for the Fourth of July, an elf or Santa for Christmas, etc. I think you get my drift. I may be too late also but Picture a lonely country road that isn't traveled much and has a creek running along it. Pencil in a pull-off where fishermen park while they fish and have bonfires. Perfect place to dump.a body and burn the remains!